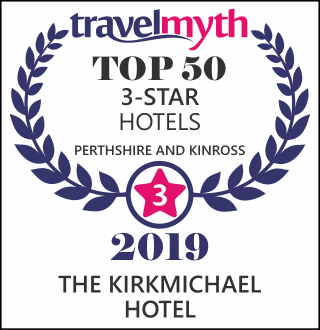 The Kirkmichael Hotel is a charming Victorian era Coaching Inn set in the village of Kirkmichael, nestled in the Strathardle Glen in Highland Perthshire. Only a 15 minute drive from Pitlochry. Please contact us to book the function room in advance. It’s location on the edge of the Cairngorm’s National Park serves as a home base for the outdoors adventurer. Only a 15 minute drive from Pitlochry. Five spacious, well appointed, en-suite rooms offer a warm welcome after a day on the river, mountains or moors. All rooms are equipped with satellite television. The vibrant Kirky Barinvites you to enjoy our wide variety of beers, spirits and the finest selection of Malt Whiskys. The Art Gallery & Tea Room hosts revolving exhibitions of an group of eclectic artists. We offer complimentary drying facilities for your ski or walking equipment. Gun cabinets are available for guests who require them. When the conditions are right the skiing is as good as you will find anywhere. All grades of skiier are catered for, from gentle nursery slopes to black runs. Perthshire has many beautiful historic buildings to visit and is a great activity centre. Skiing, walking, shooting, cycling, horse-riding, fishing & much more. The Cateran Trail is a 63 mile circular walk that passes within yards of the Hotel and offers some of Perthshire’s most beautiful views. We are a Cateran Trail Hotel. Roll out dog beds provided in each room.